A string of investment deals struck in February is poised to make Russia the number one car market in Europe by 2015, say experts. It was a race against time, but global carmakers beat a deadline to sign off on new investment agreements at the end of February that will exempt them from new tightened limits on imports. The Kremlin will hike duties for any producer that has not promised to enhance production to 300,000 units and increase the proportion of domestic inputs to 60% by 2020. Of the eight global manufacturers already working in Russia, six have submitted proposals and the new investment agreements are expected to be signed by June, says Alexander Rakhmanov, the director of the automotive and agricultural machinery department at Russia’s Ministry of Industry and Trade. Russia is underinvested with approximately $1400 per capital of foreign direct investment in 2010 compared to between four and eight times as much for the Central European states. Yet the government’s investment strategy for the automobile sector has turned out to be highly successful. The state negotiated attractive tax and import duty breaks for foreign companies willing to build factories in the middle of the last decade and several automotive clusters have emerged. The biggest ones are in St Petersburg and Kaluga region while the production of foreign brands by Russian factories soared to the point where the international companies were out-producing the leading domestic manufacturers Avtovaz and Gaz in 2008. The new investment pacts are deigned to follow on from the current agreements that expire in 2020. The Kremlin is in a rush to finish reforming a sector that employs well over a million people as Russia is widely expected to accede to the WTO this year that comes with a mandatory reduction on import duties for cars. Rakhmanov says the production of passenger cars is already sophisticated enough to compete with the international producers head-on. - The absolute leader in sales in the first quarter of 2011 is Lada (121,251). - Renault in second place with 31,031 cars. - Chevrolet and Kia are 3rd and 4th with 31,003 and 30,250 cars sold respectively. The investment policy for the automotive sector is starting to look like an unadulterated success that is fulfilling the Kremlin’s key goals of modernising and diversifying the Russian economy. Rakhmanov is confident it will become both an investment node for building the industry and also act as a blueprint for other sectors. The new investment comes with the badly needed international expertise and technology that will drive Russia’s modernisation. In return, the automakers get easier access to what could be Europe’s biggest in the next four years. "International car makers are pretty excited, because they forecast significant growth in car sales in the next decade. 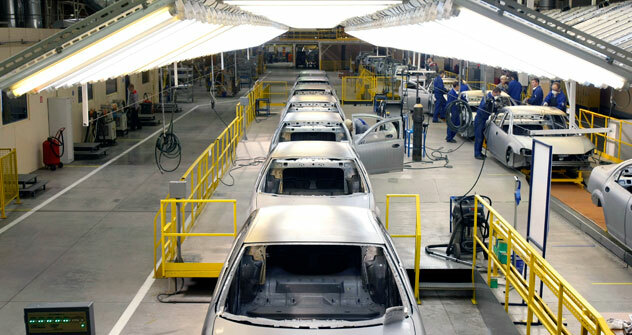 We expect that car sales will recover to the pre-crisis levels by 2013," says Mikhail Ganelin, analyst at Troika Dialog. Already the new investment deal has led to a raft of joint ventures and a big increase in investment commitments. The US' Ford and General Motors, Germany's Volkswagen and Japan's Toyota have all announced investments of over $1 billion to boost local production and stake a claim to markets ranging from St.Petersburg to the Pacific Rim port of Vladivostock.